Rhubarb Dump Cake Tastes Like Strawberry Rhubarb Crisp! I made this rhubarb dump cake immediately after finding rhubarb for the first time this spring. Rhubarb season is way too short, and if you don’t get some the moment you spot it, you just might lose out altogether. At least that’s how it seems to go for me. Anyhow, this rhubarb cake is the first of my rhubarb recipes this year, and so as long as I can keep finding it, I’ll keep baking with it. I’m a little obsessed with rhubarb in the spring! 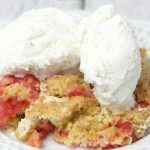 Since dump cake recipes are so quick and simple to make, so is this rhubarb cake version, and it has the added perk of tasting just like strawberry rhubarb crisp. You’ll need about 4 cups of sliced rhubarb, so get to choppin’. That’s the hardest part, and that’s not even hard! Top with a scoop of vanilla ice cream, and dig in! In a 9"x13" pan, place rhubarb evenly over bottom of pan. Mix sugar and cinnamon together and sprinkle over rhubarb. Spread dry JELL-O mix over rhubarb and sugar layers. Add dry cake mix as the next layer, then cold water and finally the melted butter. Don't mix together. Are you a rhubarb fan? Do you have any favorite rhubarb dessert recipes? I’ve made this – it’s great! My dad LOVES rhubarb. I will have to make this for him one day. There is so much fresh rhubarb at the market right now. How many servings would you guess one batch makes? I LOVE rhubarb. I tried it for the first time with strawberries as a kid and found it so delicious, but surprisingly I never see it much anywhere and never find it it my market to buy it and remake it myself. Thanks for this great recipe! YUM! Looks delicious and not too many ingredients too! Thank you so much for sharing with us at Merry Monday. We hope you’ll come to the new party. We’re celebrating our anniversary with a big Giveaway. Thanks for joining Delicious Dishes Recipe Party again this week! Hope to see you again next week! This looks amazing and actually like something I could make! I’m so glad that spring and summer fruits and veggies are coming! Now this is something I would love. I LOVE rhubarb. I have to add this to my list to make. YUM! This is my kind of recipe. I’ve been looking for a good rhubarb dessert. Can’t wait to try this one out! Omg it’s years since I had rhubarb and now you have me craving it!! This looks like something I’d like to try. I think I’ve only had rhubarb once or twice. I remember my grandma having some in her garden when I was a little girl. Can you believe I haven’t tried baking with rhubarb yet? I hope I see one in the farmer’s market so I could try it. Looks like a great recipe – I’m not much of a baker but I’d love to try this! I’ve never had rhubarb, but this looks really good. I’m recently transitioning into a vegetarian so it’s nice to see new options out there, especially for me. Thank you so much for this recipe. Ah, this seems delicious. I have never had an experience of trying rhubarb. I would first like to try it before making something out of it myself. It does look pretty simple. I like it. I don’t like complicated things. I don’t have time to make complicated things. That looks so delicious. My mom will love this for sure, I would like to give a try. Thanks for this! I just love anything that is done with rhubarb, but never had a chance to do something on a dessert with it. But this looks absolutely delicious & healthy, a wonderful recipe that my kids would love right away. I don’t think that I have ever tasted rhubarb, especially in a dessert. I like how fluffy and light this cake looks in the photos. Looks fab Liz! I should make some this weekend! What?? This looked way too simple! Watch me try this and burn it lol But for real though, looks delicious! I’ve never use rhubarb in any recipes before! Would be awesome to try making this recipe! I love that it is spring now … fresh local produce is on the way, and with it, treats like these! I can’t wait to try it, it looks so good and yummy! I am a huge fun of pies! This one looks unbelievably delicious and I love the addition of the cinnamon! Great recipe! Pinned it! Strawberry rhubarb pie is my fave, so I would imagine I would LOVE this cake! I love the colors! Turns out beautifully without a lot of effort – can’t beat that! You know, I don’t think that I have ever in my life ate a rhubarb. Lol. I am a massive fan of rhubarb! It is just so fresh and flavoursome. This recipe looks so easy, and very delicious! That is a great recipe. I think I’ll pin this one to try at a later ate! I mean a later ‘date.’ BUT then I thought of you saying you have to get rhubarb quick or you’ll miss out, so maybe I’ll make it this weekend! That looks yummy. Although I’ve never tried rhubarb nor do I know how to use it lol. I am so in love with dump cakes right now! 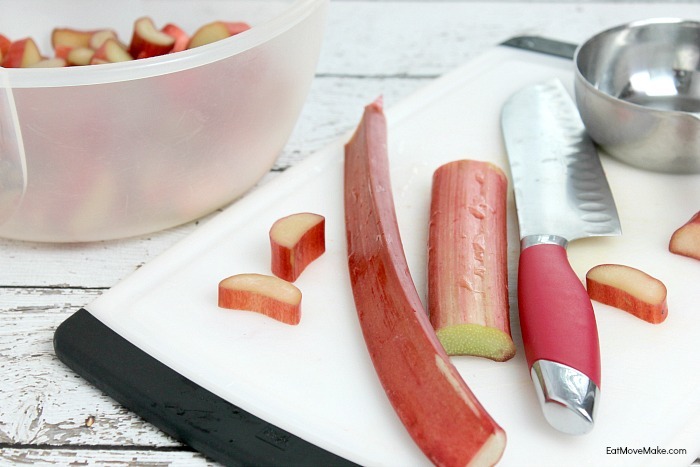 I need to try this one soon – a friend has lots of rhubarb to share so it’s perfect! Confession time. I’ve never had rhubarb. This is going to be my first experience, and I have a feeling it’ll be love at first bite. I haven’t either!!! I can’t wait to give this a try. I’ve had rhubarb pies but never have come across cake. This reciepe looks delecious and I am going to try it. I have never heard of this but it looks delicious! I love dump cakes, but I’ve never tried rhubarb before! Sounds yummy! Oh my goodness to many times YES! I could definitely eat a whole pan of this deliciousness!! Wow. this really looks amazingly delicious. Would love to try this out soon!. Yummy! Yumm.. This looks so good and easy to make too! I would love to try this recipe today. Thanks for sharing! I love how simple this recipe is! I have to admit that I don’t usually make anything with rhubarb but am going to give this one a try. You know I have never had rhubarb before. My husband likes rhubarb, I bet he would like this recipe. This looks like a recipe my family is going to love. I am looking forward to rhubarb season. I will have to make this on the weekend. This looks incredible *Crying face* Cheat day it is! OMG what a yammi cake this is super soft and tasty.i will definatly try this recepie. Oh my gosh, you’re so right. I look forward to rhubarb season all year long, only to have it pass me by some years. I’ve started looking already, but haven’t found any yet. I’m trying this awesome cake the minute I find some! This absolutely looks delicious and I love this it’s easy recipe. I’m so glad that you share this recipe with us. 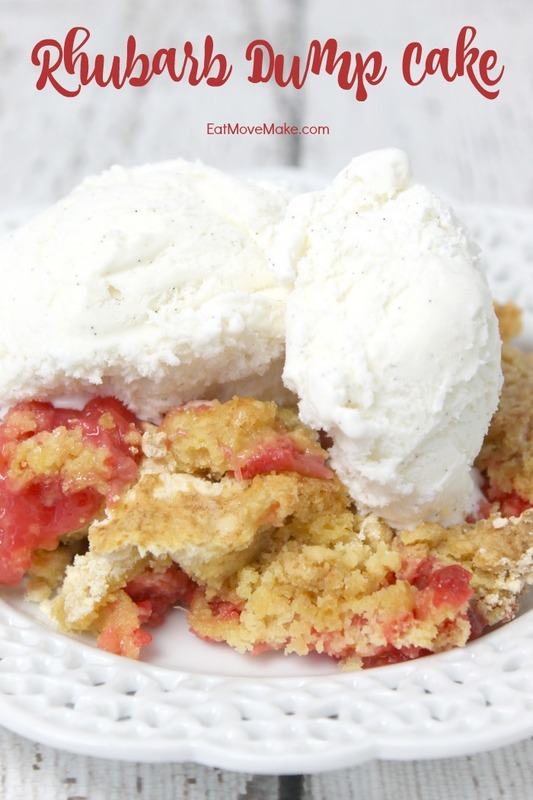 Rhubarb dump cake looks so delicious and is so simple to make. This recipe has made into our baking experiment list and we are going to try it very soon. Thanks for sharing! This brings back memories of picking rhubarb out of the garden and talking my mom into making rhubarb pies. I can’t wait to try this recipe and share it with my mom. She don’t cook anymore so I bake her goodies all the time. It hs been years since I have had a rhubarb dessert. I have to remedy that soon! I have to admit, I’ve never had rhubarb before! Gasp! You make it look so yummy though…I’ll have to try this. I love recipes that are easy to follow and make and this is both! This looks awesome! My mother loves rhubarb and this is a great treat to make her on Mother’s Day! Thank you for sharing! I really love easy recipes! That looks so good and yummy! I need to try this. Thanks! Can’t believe how easy this is. It looks very delicious! This is such an amazing cake! I’ve never made rhubarb cake, I can’t wait to try it! Hey, I’m from NC too! 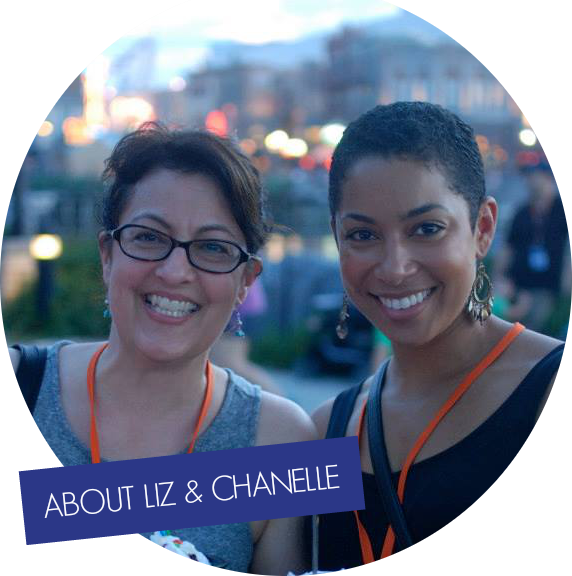 So happy to find your blog, your recipes look amazing! Although, I’ve never tried rhubarb before so I’m not sure how much I would like this… Still, looks good! This looks great – I am very curious as I have not tried rhubarb before. I do like the ice cream topping for sure! Looks like a cool and delicious cake. I like this one. This recipe looks amazing but I couldn’t help and look and Chanelle’s amazing pictures in the side bar! I’ve really let myself slip recently and I’m so jealous of her hardwork (and body) x I’ve not been here before but I’ll definitely be coming back! I love rhubarb, but what I love even more is how easy this cake is! This sounds like my kind of cake! Can’t believe how easy this is, and it looks delicious. How delicious! Will have to add this dessert to my menu for next week! I wonder how this would be without the strawberry jello. I LOVE rhubarb, but I don’t care for other flavors mucking it up. This looks really good. I never thought of using Rhubarb in a cake recipe. I have not had rhubarb in a cake like this before!! It sounds really good, we get rhubarb at our farmers markets a lot. Gosh I love rhubarb when it is in season. I have never made a dump cake with it…I will have to try. I am not a huge rhubarb fan but I think that is only because I haven’t taken the opportunity to cook with it much. I think this cake looks easy and really good! Wow, what an interesting combo! And to top it with ice cream. Looks AMAZING! I have a confession to make, I’ve never tried rhubarb! I had it in a yogurt a few days ago and now I’m dying to get my hands on a strawberry rhubarb pie. Yum, I love cake! That looks fantastic! I use to eat rhubarb all the time when I was a kiddo. I have got to make this. This looks delicious. I love how simple it is! I love the whole idea of dump cakes. This one looks delicious! I promise you I have never ever bought a rhubarb or made anything with one. But… there is always a first time. You just may have inspired me with this great sounding recipe. I wonder if this would be good with strawberries or blueberries. I’ve been wondering about what a dump cake is, until I watched the video. That’s an easy way to bake things, really. Thanks for the recipe, it looks really good and it’s definitely worth trying! My mom always raved about rhubarb pie that she had when she was young. I bet she would love this. I like dump cakes because they are easy and don’t need to look super pretty. This looks so tasty! Dump cakes are great because they’re so easy to make. I don’t think I’ve ever tried rhubarb in a cake before. I love strawberry rhubarb pie, never had this before though. I bet I would love it and eat it right up, considering I used to eat rhubarb raw picked right out of the garden at my family farm! I’ve always been curious about Rhubarb. I’m not sure I’ve every actually tried it, but this crisp looks so yummy. This looks SO delicious. I’ve never had rhubarb before, but my mom loved it and made so much with it when I was a kick. I’d love to give this a try! I love dump cake and my husband loves rhubarb so I will have to try this out. It sounds perfect for a summer BBQ. This looks SO GOOD! We have family coming in from out of town this weekend, I need to try this! This looks so yummy. I discover Rhubarb when I started making smoothies. It’s so delicious, I love the faint tartness of it. Wow this is a nice cake to mak for the family. Thanks for sharing. This would be perfct to make with family coming in town next week! Great idea! I am so chicken when it comes to rhubarb! I see it in the store and avoid it! I never have been comfortable with it… maybe I should make this and just get over it already?! I’ve never heard of dump cake before but I flipping love rhubarb so I’m definitely going to be giving this one a try soon! 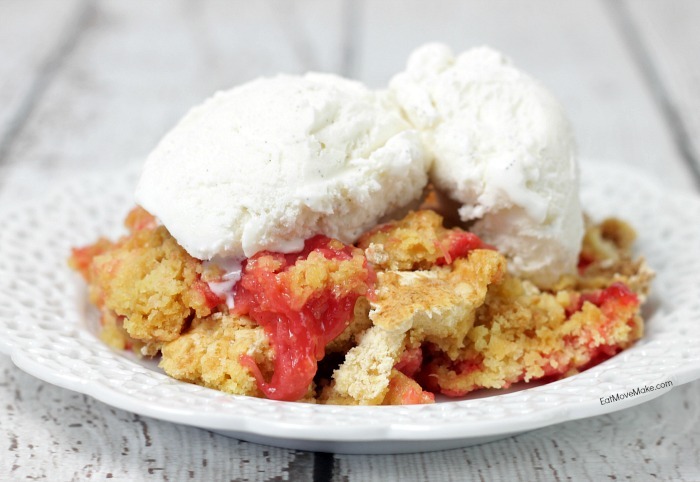 This Dump Cake looks and sounds so delicious…love Rhubarb!! I’ve never made a Dump Cake before, but I think it’s about high time that I did 🙂 Thanks for this recipe! Okay, I’m not much of a rhubarb fan, but this cake looks delicious! So easy to make too. I’ll have to try it. Well this looks delicious and easy enough even for me to make! Thank you for posting! Wow this looks delicious, and to be honest I never heard of this one before! Thanks for the recipe, i will try it out for sure! Yum! Strawberry rhubarb is one of my favorite pies. I think this might be the first time I’ve ever seen it in a cake form. Thanks for sharing this great twist on an old favorite. I have never heard of a dump cake before this and now I want them every day. Great post! This looks delicious, and fairly easy to make! I like! I haven’t seen anyone use rhubarb since i was a child and grandma would make strawberry adn rhubarb pie. I am so going to have to make this. I once tried Rhubarb ice cream and it was really good. I bet that I would really love this, too. That looks so yummy. I’ve never had a rhubarb before. I would love to try this. So yummy! I haven’t used rhubarb in forever and you’ve totally inspired me. Also, I always love your recipe format. The ease of printing is genius. I love rhubarb. Only a few more weeks and it will be ready for picking. The way it looks at the moment we could be in for a bumper crop so I’ll be trying all the recipes I can find that include rhubarb! I love you rhubarb. I want to make this so bad I wish the rest of my family would eat it. This is another one on my list that I need to make when I have company over. Oh boy I’m going to be making this – thanks for the recipe! This does look good. I’ve only had it in pie before. I love how easy this is to make. I also love that I can just chop the rhubarb and not have to pre cook it. I would love to try this a la mode, I’ll have to make this soon! I love rhubarb. I have such fond memories of rhubarb crumble as a kid but I haven’t had any since school. This sounds quite simple to make so I’m going to have to give this a go. This looks delicious! I’d love to try making this! Would be nice to make something different than a normal sponge! Never heard of this cake before but I’m trying if out on the weekend. Looks delicious. I love dump cake! It’s so easy to make and it always turns out well. I don’t know if I have ever actually tried rhubarb. Dump cakes are my favorite because they are so effortless! They’re perfect for pot lucks or get-togethers. Oh, I used to absolutely adore this cake when I was a child. I remember my mother used to cover it in egg whites that would transform in meringue in the oven. I used to love that combination.